The best things in life do not cost a single thing. I realize that money is needed to pay bills so that you have a house to live in, electricity in your home, food on the table, etc. They are necessities that we often times take for granted. We are so blessed in this life and have more than we truly need in material things. But, what about heart things? Those moments that take our breath away? To me, some of the best things in life are cuddling on the couch watching a movie with your love, holding hands, and feeling their arms wrapped securely around you. I also love cuddling with my children as we take turns reading pages in a book, or our snuggle time right before bed. The quiet moments we share together are so precious to me. The whispers before they drift off to sleep after I’ve tucked them in for the night. How they ask me to give them a mini facial as they prepare for dreamland, and I watch as all of the worries of their day melt away. How about calls from your parents just to say that they are thinking of you and they love you? I treasure those. They just want to check on you and let you know that they care. Or, like my dad just did out of the blue – he sent me a beautiful bouquet of flowers to my work. I did not expect it at all, and yet he did something so sweet that just melted my heart completely. I love my parents, and my dad is one heck of a man! There should be more men in the world like him. And then there’s time spent with my best friend … my horse, Sugar. There’s nothing like grooming her and getting her all ready to ride, and then when I lift myself up in the stir ups and sit on top of this beautiful horse, I feel more alive than I have in a very long time. Feeling every single movement as she slowly walks along, feeling as if we are one – my partner and I. These, sweet people of the universe, are some of the best things in life. Nothing compares to them or could even come close! Take time to appreciate the people in your life and make time for them. You don’t have to spend a lot of money, but be intentional with your time. Give the gift of your time to others. Something magical will happen. You will be touching someone’s heart completely, and at the same time, your heart will be blessed also! God has given us this beautiful, amazing life … some times there will be rough spots along the way, but He is there through every single one of them walking right beside you, and even carrying you when needed. Love this life that you’ve been given. It is yours. No one can live it like you can. God has called you to live, to love, to show care and compassion for others around you. Treasure and cherish the people that are in your lives. They may not always be there. We never know when God will call one of us home. You would never invite a thief into your house. So, why would you allow thoughts that steal your joy to make themselves at home in your mind? That statement makes a very good point, but I thought it needed a little more. Thus, this blog post was born! We do it all the time! You know it’s true as you’re guilty of it yourself. Intrusive thoughts worm their way into our minds throughout the day. Some times we can quickly dismiss them when we realize the garbage that is trying to fill our heads. Other times it is hard to stop obsessing over those same thoughts that just will not go away. We beat ourselves up over things in the past. Things that we have no power to change now. The past is history. It’s over, except for the memory left behind. Good or bad, it is up to you whether you allow the good from the situation to remain engraved in your memory or whether you will allow the bad that occurred to overshadow the fun times and good memories. Which would you rather focus on? Surely not the bad. Then why DO we allow those bad thoughts to remain? Kick them out! Don’t let them live in your head any more. They threaten to steal every bit of your joy and happiness. It sounds silly to even say this, but I’m going to any way. When an intrusive negative thought just will not go away, command it to do so. Even if you have to say STOP! out loud – DO IT! Force those negative thoughts out by the power of that one word and allow good memories to rush in to take their place. If this doesn’t work, try putting a rubber band around your wrist. If you find yourself obsessing over a negative thought, something that brought you pain in the past, or a situation that was simply out of your control, pop that rubber band! Once you feel the sting of it against your wrist, it will bring you back to the present day and make you realize that the pain that thought provided was not just emotional pain and mental anguish, now it is physically causing pain. This alone should be enough to make you stop hurting yourself with the thoughts that you’re allowing to remain. Whatever it takes, replace the negatives with positives! Drive out the negative thoughts with bible verses that you’ve memorized. Drive out the negative thoughts by reciting a poem. If that fails, then put on some of your most favorite music and turn it up as loud as you can stand it. Then sing to it to the top of your lungs. I promise you that you will feel better afterwards! But please … don’t put a sad song on repeat. Find something uplifting that will leave you feeling like you’re ready to soar through the sky afterwards like a beautiful eagle or a butterfly visiting the various different flowers on a bright afternoon. Let the music lift you higher and take you to your happy place. So answer truthfully. Is there a thief in your house? Consider your head the house that we’re speaking of at this point. Have you allowed negative thoughts to occupy your mind? Have they strolled through, kicked back on the couch in your mind and put their feet up while they sip coffee, refusing to leave you in peace? If so, it is time to kick that thief out! Do not allow them to steal one more happy thought from you. Do not allow the thief to take one more positive thing from your mind that is the house. Drive the thief out. It will take practice, but you can redirect your thinking. It is possible if you view your brain, mind, or your thoughts as the horse and you as the rider. That horse likes to be stubborn at times and do what it wants to do. It wants to go where there is no trail and carry you through briars and bushes, getting you all tangled up along the way. By the time this horse finishes, you’re battered and bruised. But, you can take back control at any time. Pull back on those reins before it’s too late, and redirect this horse. You are the confident rider taking charge and are back in full control again. Take action today and no longer allow your thoughts to run away with you. I know that God will not give me more than I can bear. I just wish He didn’t trust me so much. There may be times when you feel pushed to your limit. You may feel like you’re hanging on by a thread even. When you’re at your wits end and are not sure how much more you can take, know that God will not give you more than you can bear. He won’t. Also, know this. God will be with you every step of the way, even carrying you when He needs to in order for you to make it through. With everything that you’ve been through, know that there is someone else in the world that has it worse than you do. When we stop to consider just how blessed we truly are, our problems begin to lose their grip on us. The problems may still be there, but it helps to change your way of thinking about them. Instead of focusing on the negatives of your situation, try to think of a positive in the situation. I promise you, as bad as you think your problems are, someone somewhere else in the world has it a lot worse. It takes a lot of effort, but when you find yourself starting to dwell on your problems, try changing your focus to something a little more positive instead. Easier said than done, but trust me. You have so many blessings in your life. You have so many things to be thankful for! We are so blessed in this lifetime! Why, then, do we focus only on the negatives? Why do we give them so much power over our lives? Let’s do something about that, shall we? When your eyes open in the morning, immediately start your day with a positive thought and a word of praise. Oh thank you, God! Thank you for waking me up this morning! Thank you for the gift of another day! Thank you for another opportunity to live my life to the fullest. It matters how you start your day! If you wake up and begin with negative thoughts before your eyes ever open, you won’t have as good of a day as you would if you begin your day with words of thankfulness and praise. When you wake up, take a deep breath in and thank God for waking you up with the morning light. Thank Him for allowing you to be with your loved ones another day. Some people didn’t get that extra day that you’ve been given. When your feet hit the floor, thank Him that you can get out of bed in the mornings. Thank Him that you had a bed to sleep in last night and covers to warm you. Some people do not have this luxury. When you walk to the bathroom to get a shower, thank God that you’re able to walk! Thank God that you’re able to do for yourself. Others have to depend on people to bathe them as they are unable to do that for themselves. Think of how blessed you are, and say a special prayer for all of those that are going through this and for the precious caregivers. Neither the patient nor the caregiver have an easy road ahead of them that day, yet here you stand under the warmth of the shower. Don’t give into the temptation of a complaining spirit. You have much to be thankful for! Make time to read your bible or a daily devotional and pray before starting your day. I have heard people that say they just don’t have time for this. I say that you DO … you don’t have to get down on your knees every single time to pray. You can pray while you’re in the shower, having breakfast, or driving down the road going to work or school. You CAN find time. If your mind can wander to all of the negatives, you have time to gain control of your thoughts and go to God in prayer. That is when you need to re-focus your attention any way instead of remaining in a negative state of mind. You DO have time to pray! As far as not having time to read your bible or a daily devotional, that isn’t true either. There are some devotionals that don’t require a lot of time, yet their messages are powerful and will have you thinking on them all day. My husband reads Joel Osteen’s daily devotional every morning. I am partial to Joyce Meyer’s daily devotional. Jesus Calling by Sarah Young is also a very powerful daily devotional. They do not require a lot of time, yet they leave such an impact! Try it! We are blessed in this life. If we would just take a moment or two to redirect our thoughts, it will make a difference in how our day goes! It has been proven! Will you try it? Will you make an effort to be more positive and to start your day in a more positive manner? Will you count your blessings instead of focusing on your troubles? 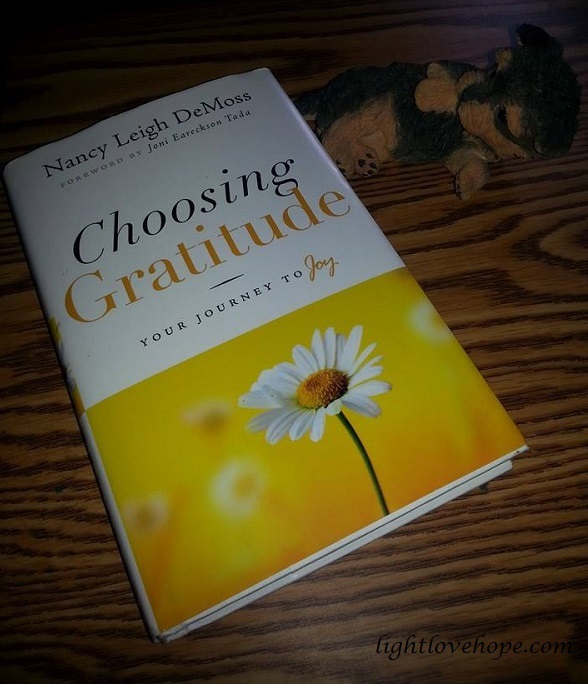 Many months ago, I purchased a book entitled “Choosing Gratitude ~Your Journey To Joy.” That book has sat below my coffee table in my living room just waiting for me to fling open the cover and dive in, to allow the message to soak into my being and bring about a greater awareness of how we all need to have more gratitude in our lives. I have tried to be more intentional and purposeful in my way of thinking. Likewise, I have tried to be careful of the words I allow to come out of my mouth. If I begin to think negative thoughts, I try to stop myself and redirect my thinking to something more positive. Is this always easy? NO! It’s not, especially if you are going through a very difficult time in your life. When you’re struggling, that is when you need to find gratitude and joy even more so than ever before. That is the hard part. How can you find gratitude and joy in the mist of a storm? Well, I’m here to tell you that as bad as it may be, it could always be worse. Count your blessings and consider yourself so incredibly blessed because you do not own all of the problems in the world! Yes, you may have it bad, but there is someone out there that has it worse. I’m not trying to minimize your pain or your suffering. I’m not trying to say that what you’re going through isn’t important because it IS! What I’m trying to get my readers and myself to realize is that there is always something to be thankful for. Immediately upon picking up this book and reading the Foreword, I had a new found appreciation for the author of this book. When I purchased this book I did not know that Author Nancy Leigh DeMoss had been in a wheelchair the majority of her life. If she can be grateful for her quadriplegia (as she states in the Foreword), what in the world is our problem? We have it so good, and yet we complain so much! This lady has to have people do everything for her; help into and out of bed, getting her dressed, brushing her hair, brushing her teeth, blowing her nose, etc. And yet, she finds beauty in ashes. She finds something good to smile about and offer praises to God above with a grateful heart. We are so blessed, ladies and gentlemen! 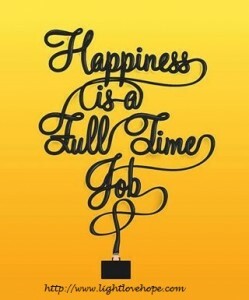 We truly are! And what do we do with the gifts we have been given? Life is not all doom and gloom, but yet the majority of our time is spent focusing on negative thoughts. We vent to others, and instead of it making us feel better, we feel worse by having re-lived those moments and things that pained us right when it happened. Now we walk around in a bad frame of mind with the corner of our mouths pulled downward in a frown with our foreheads wrinkled because we’re mad at the world. At that moment especially, search your heart for the good – because there is always good – search your heart for something that you can be thankful for – because there is always something to be thankful for. Look up to Heaven and thank God that as bad as it seems right now, it’s not any worse! Thank Him for the plan He has for your life because He assures us in His word that He does not have plans to harm us but to give us hope and a future (Jeremiah 29:11 is one of my favorite bible verses and is the “hope” part of our name: Light Love Hope). There’s a beautiful flower on the front cover of her book. She’s unable to plant a garden or even walk through a meadow filled with wildflowers. Yet, I can imagine that she still appreciates the beauty of the flowers and the Creator of all things. So then should we! Will you take this journey with me? Will you join me in being more intentional on choosing gratitude on our journey to finding joy? 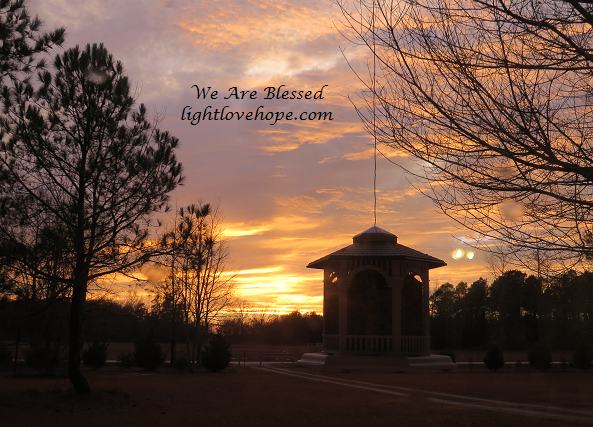 I would venture to say that I am definitely on the right track with this blog and sharing God’s light, love, and hope. Why do I say this? Because in doing so, I have stirred up the enemy. Remember when I posted previously that he aims to steal, kill, and destroy? He has reared up his head this past week in places you would not even dream of … like church using “church people” or fellow Christians! While it is extremely sad, this is no surprise as we have had this happen to us before in churches. My dad even reminded me this week that the devil is more at work in the churches than one would like to believe. He is. People, beware! Then today I had a “friend” attempt to launch an assault at me as well. Wow. If you’re wondering why I chose to word it that way … it is because although she attempted, I did not take it on. Although she tried to draw me in to her negativity, I did not allow it. I did not entertain it. I, instead, chose to continue in peace. I chose to continue to remain in a calm state. I chose to not be offended. I chose to hang on to my joy!